Simplicity at its best. This salad tested my urge to go overboard with toppings. I was craving a light salad that still felt hearty enough to fill me up at lunchtime. I’m guilty of overdoing toppings when it comes to salads and the truth is, when I do that I’m basically eating trail mix with a few leafy greens thrown into the mix. And trust me, there’s definitely a time and a place for that! However, it’s good to force myself to hold back and let the true flavors of each ingredient shine. I was tempted to add a creamy tahini dressing, roasted chickpeas, sunflower seeds (along with the toasted hazelnuts) feta cheese, and well, you get the point. This salad turned out to be one of the best salads I’ve had with very minimal ingredients. The “dressing” is just olive oil and lemon juice massaged into the kale and finished with some flakey sea salt. It’s bright and flavorful and a good reminder that simplicity is best. This salad is lovely on its own but I think it would taste great served alongside a main course like soup, grilled meat, or a simple pasta. I hope you all enjoy this seasonal meal as much as I did. It’s delicious and will be my go-to lunch for the rest of the week. Cheers from a very snow Tumbleweed Farm! Preheat the oven to 425F. Toss the squash with 2 tablespoons of olive oil and sprinkle with salt and pepper. Place in a single layer on a rimmed baking sheet and roast in the oven until tender, about 18-20 minutes. Flip the squash halfway through cooking. While the squash cooks heat a small dry skillet over medium-high heat. Add the hazelnuts and toast until lightly brown and fragrant. About 5-8 minutes. Shake the pan often while toasting. Once cool enough to handle roughly chop the hazelnuts. In a large bowl massage the kale with the remaining 1 tablespoon olive oil and 1 tablespoon lemon juice. Massage the oil and juice into the kale until it becomes tender and turns bright green, about 2 minutes. 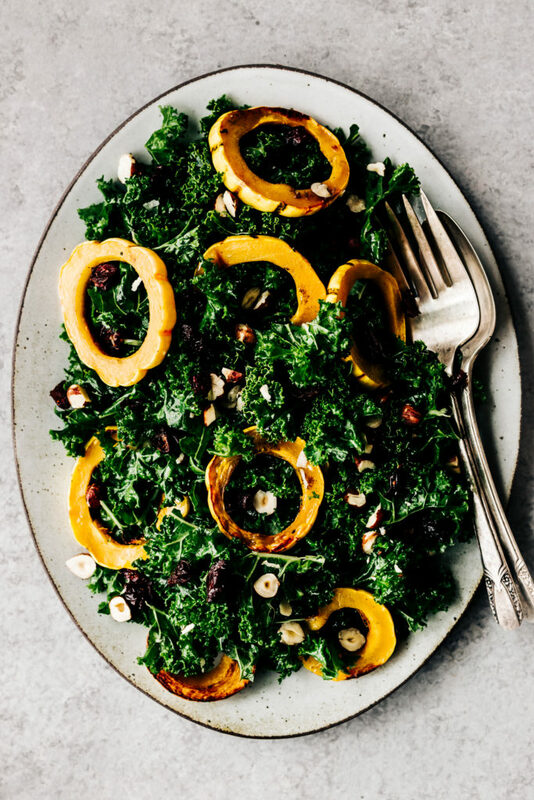 Add the roasted squash, toasted hazelnuts and dried cranberries to the kale. Season with flakey sea salt and serve. Are you eating the peeling? Yes! The skin in Delicata Squash is tender and easy to digest. Happy cooking! What a delightful salad! Love it!